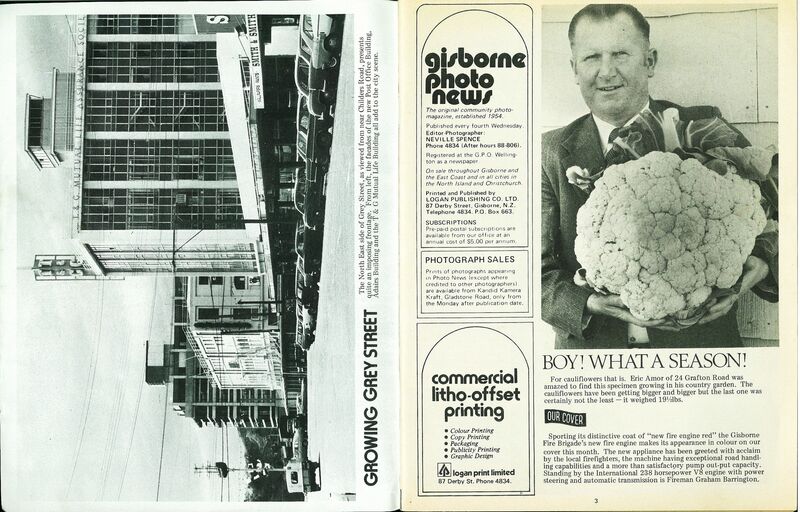 Logan Publishing Co. Ltd. 87 Derby Street, Gisborne, N.Z. Telephone 4834. P.O. Box 663. The original community photo-magazine, established 1954. Phone 4834 (After hours 88-806). Registered at the G.P.O. Wellington as a newspaper. On sale throughout Gisborne and the East Coast and in all cities in the North Island and Christchurch. Pre-paid postal subscriptions are available from our office at an annual cost of $5.00 per annum. Prints of photographs appearing in Photo News (except where credited to other photographers) are available from Kandid Kamera Kraft, Gladstone Road, only from the Monday after publication date. 87 Derby St. Phone 4834. All images and text on this website are made available under the Creative Commons Attribution-NonCommercial-NoDerivs 3.0 New Zealand (http://creativecommons.org/licenses/by-nc-nd/3.0/nz/).